Ok so I pulled my kites out after 30 years and I can figure out most of them but the quadraflex has the bridles off and I can’t remember how or even if I did have it together when I was flying. Are you on FB? 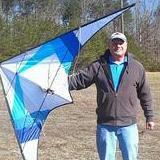 Andy at Ocean Shores Kites has extensive knowledge on fixing up old kites. Yes and I will try him. Late 80s early 90s is when I was flying this kite. You definitely have me beat by few years. I started back in 1993. I don't remember ever seeing that kite before. 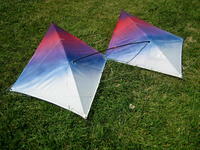 Wow, thats really similar to Lam's quad kites. No real "center" panel to help stabilize it. Definitely the cross-over LE system ending in the verticals. Hi, Sodog, and welcome to the forum. Where are you located? If you're in the Chicago area, I can give you a hand figuring out how to install that bridle. The bridling should be quite similar to a Rev as far as to which points it attaches. I would be inclined to mount the frame on the back side of the kite, or at least the vertical members in back for some directional stability, like having a keel on each side. At any rate, treat it well. It's definitely a collectors' item. I'm not saying don't fly it, just don't abuse it. With the LE rods terminating in the verts, then that would mean the ends of the LE rods must go behind the sail too. Much like the ABS. Nope, see the hole in the sail? It's unlikely that it would be there if both LE and verts are on the same side of the sail. I've built a couple of quads where the cross-member went through the sail, similar to a Deca. Perhaps it was designed to offer that flexibility for matching the conditions or different flight characteristics. I'd sure like to get my hands on that sail for a few days. Maybe I'll just build one. Got a feeling that hole is there to eliminate any wear from the fitting, but maybe I'm wrong ....Maybe! I think you are right it went through I’m just not sure what was in front and what was in back. I'm pretty sure the verticals should be in back. The leading edge out in front will allow the area between the verts to billow some, creating more of an airfoil cross section, and not creating air dams on the horizontal to impede forward or reverse motion. If the verts were in front they create scoops toward the ends that would most probably cause instability. I'm basing my opinion, and it's only an opinion because I have not found any facts yet to support it, on quad kites I have built. I my experience any time you have a cross member running across the kite it will create air dams above and below it, which can drastically impede motion in either forward or reverse flight or even both. This is an extreme example of how much it can affect motion. This is an example, only in the horizontal direction. It nearly refuses to side slide. Yes, it's a quad.